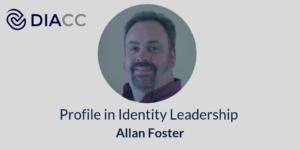 In our recent ‘Profiles in Leadership’ video, Joni Brennan had a conversation with Allan Foster, who is a DIACC Director and VP of Global Partner Success at ForgeRock. The two discussed identity innovation, open banking and Canada’s collaborative approach. ForgeRock, a digital identity management platform, is headquartered in San Francisco, CA, but is active across the globe. He pointed out that Canada’s relatively small size (about 35 million identities across the country) make it a manageable size with which to “do a project and succeed, however, it’s also complex enough to be interesting.” Multiple governments (federal and municipal) add additional complexities. The Government of Canada recently ran a consultation for open banking to better understand the issues around it and how Canada would develop its strategy. As ForgeRock was a key contributor to DIACC’s response to the open banking consultation, Allan was asked why he sees identity and open banking as being so interlocked, or relevant to one another. “What we’re now seeing is with the digital age, banks are needing to change the way they interact with their customers,” Allan said. He pointed to multiple, often competing entities (“frenemies”) within a sector. One group of banks may offer saving accounts to a certain group of customers, while another one offers credit cards to that same group of customers.